Join the discussion on our forums! Come discuss Azerite Elemental over in our dedicated Azerite Elemental discussion topic. A sleeper for sure. It's high health and the snowball potential make this card quite insane if you don't deal with it quickly. 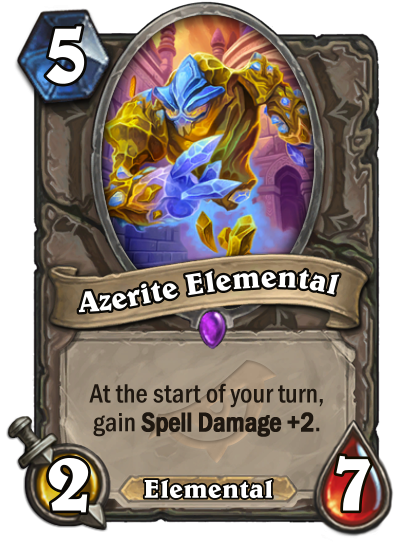 We have not so much 5-mana elementals for the Elemental synergy. Nice addition. 7-health is hard to deal in one turn. Can be combo with 4-damage Blizzard or 3-damage Arcanosaur. Can be played early with Elemental Evocation in Burn/Face Mage. I think it gains more and more spell damage. So if it sticks, it's busted.